Before entering into this discussion I need to clarify what I mean by a “tree metaphor” as opposed to a “tree symbol.” As a symbol, a tree is a substitute for something else. 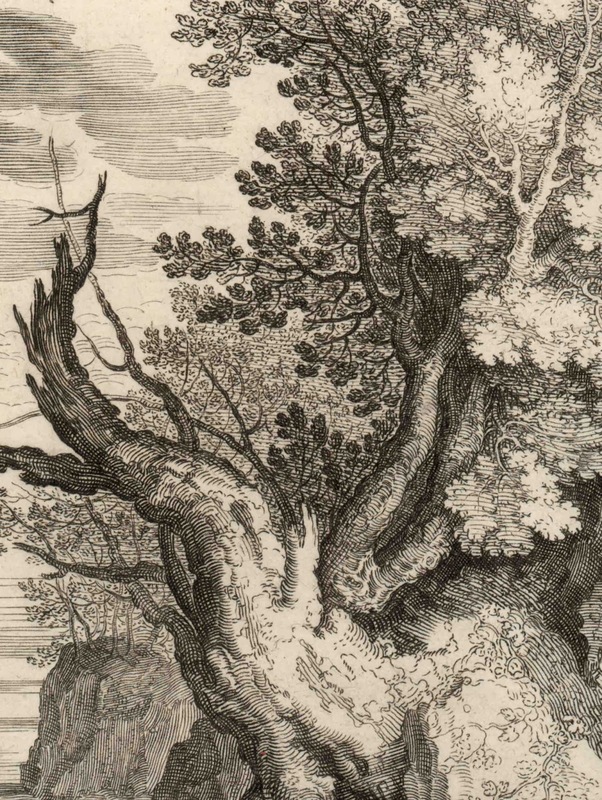 For instance, an image of a tree could be a symbol for strength, wisdom or the essence of nature, such as the logo of a tree (shown below) that I created based on an etching by Franz Weirotter (shown further below), Unter den Wasserfällen zu Tivoli [Near the Waterfalls of Tivoli]. By design, trees portrayed as symbols are usually stripped of pictorial information that may take attention away from their intended symbolic meaning (i.e. 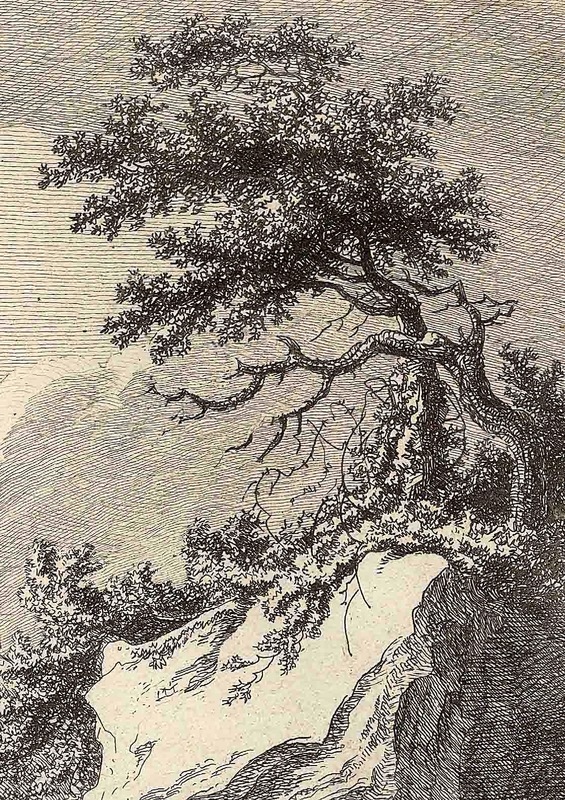 the tree may be depicted as a generic tree or as a stylised schema of foliage and limbs). As a metaphor, a tree is a pictorial device for explaining an idea or concept. 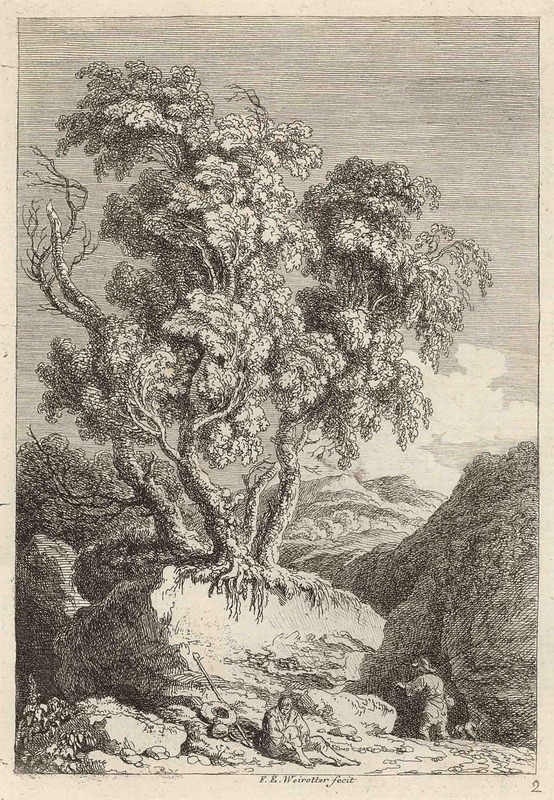 For instance, Weirotter’s etching is not about tree symbolism per se; nevertheless, the featured clump of trees in the print can be seen as projecting metaphorical meanings. 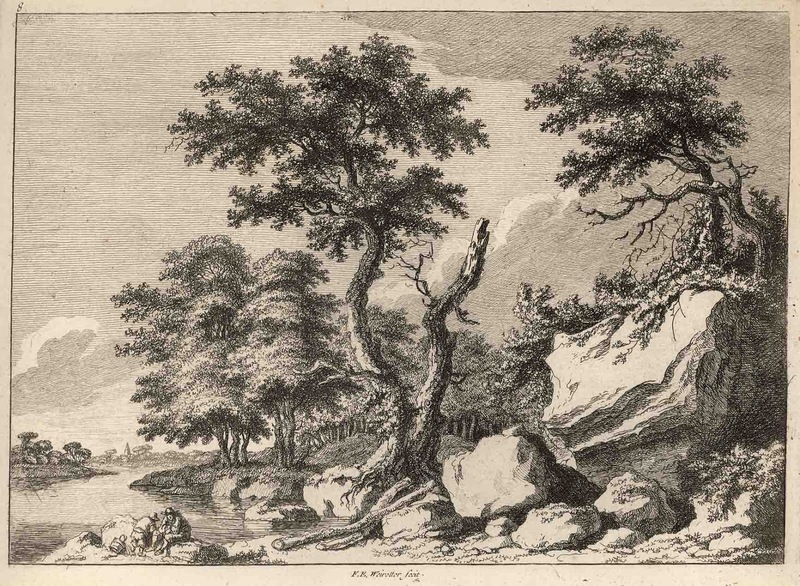 To explain this from a personal reading, Weirotter often features trees awkwardly clinging to life on top of rocks (see Weirotter’s Aus der Umgebung von Tivoli, Landscapes with Trees, Plate 8 and Pate 9 shown further below). 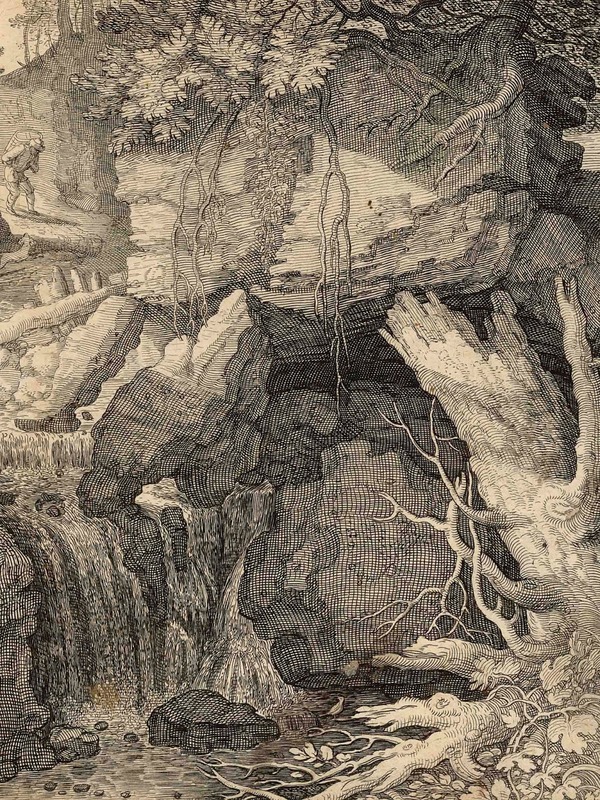 My interpretation of this curious leaning for depicting trees in this way is that Weirotter is alluding to the precarious uncertainty of life. 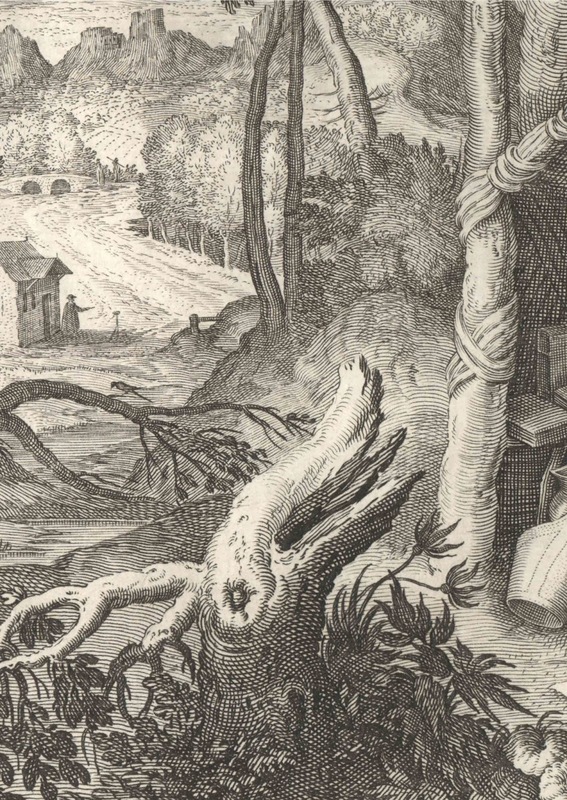 By this I mean that the trees in their portrayed predicament may soon run out of the life-giving sustenance of soil and water, or a gale may uproot and topple them. 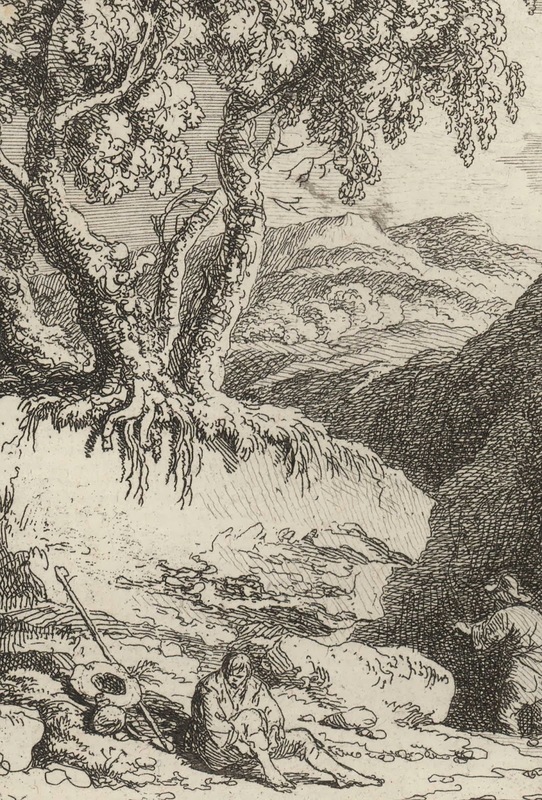 This metaphor for the uncertainty of life is enhanced by the placement of men—perhaps shepherds?—shown beneath the tree-capped boulder. Again, from personal interpretation, there is a suggestion of foreboding connoted by the closer figure’s seated pose below the talon-like roots of the trees. Moreover, the diminutive size of both figures compared to the scale of the rocky terrain and the bulging forms of this terrain amplifies the feeling of unease. 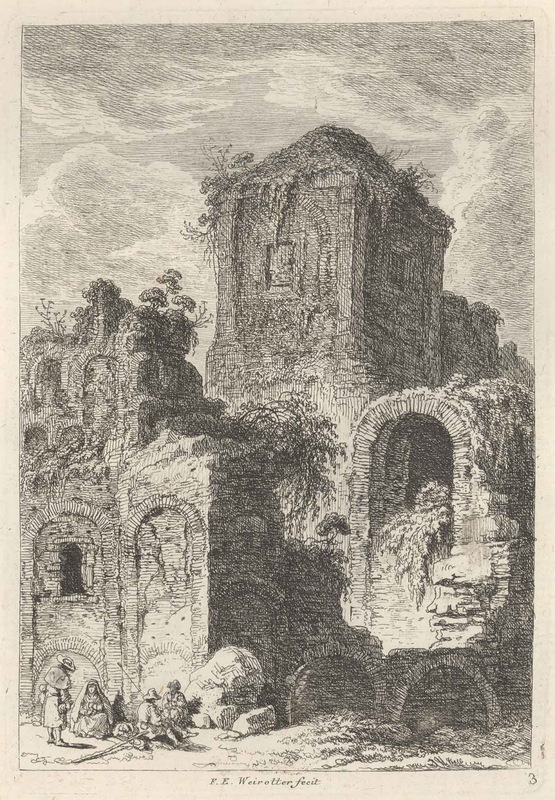 [Third Suite of Regions and Fragments of Old Buildings]. This is the second plate of eighteen in the suite. 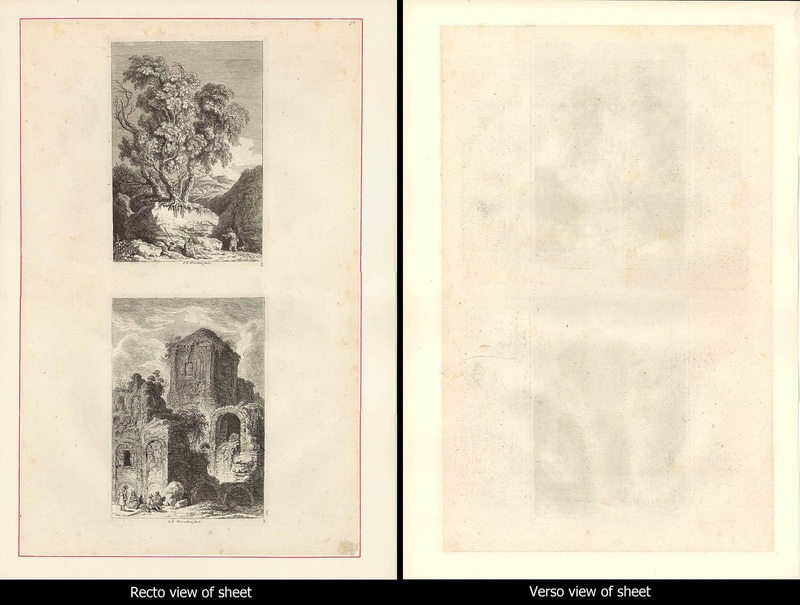 Condition (whole sheet with the two prints): Superb impressions protected by a paper support mount attached to the outer 1 mm edge of the sheet and inscribed on the mount with a red line. Beyond the edge attachment, the sheet is not glued down as can be seen in the verso view below. There is a mark (stain) on the lower-right corner. I am selling this print (Near the Waterfalls of Tivoli) and the print below (In Hadrian's Villa near Frascati) for a total cost (including shipping to anywhere in the world) of $206 AUD. Please contact me using the email link at the top of the page if you have any questions or click the “Buy Now” button below. This is the third plate of eighteen in the suite. 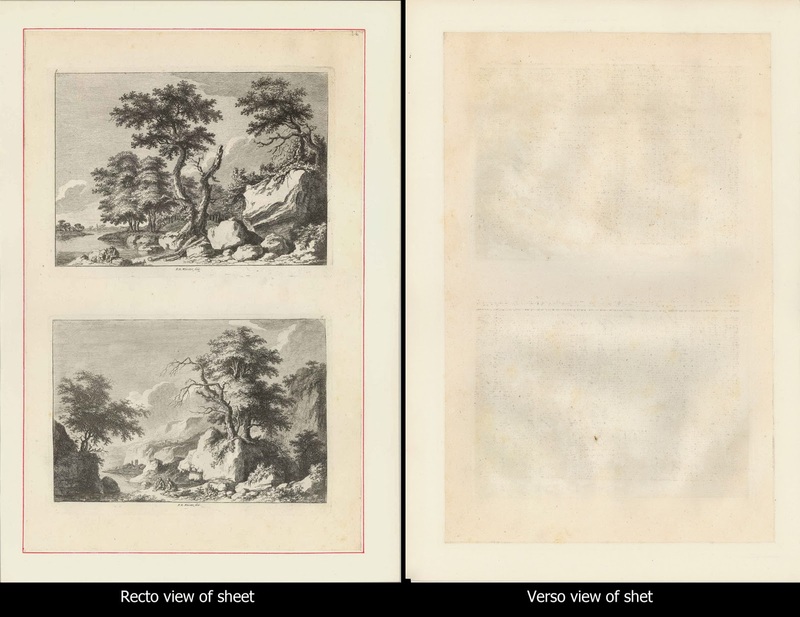 Condition (whole sheet with the two prints): Superb impressions protected by a paper support mount attached to the outer 1 mm edge of the sheet and inscribed on the mount with a red line. Beyond the edge attachment, the sheet is not glued down as can be seen in the verso view below. I am selling this print (Plate 8) and the print below (Plate 9) for a total cost (including shipping to anywhere in the world) of $206 AUD. Please contact me using the email link at the top of the page if you have any questions or click the “Buy Now” button below. 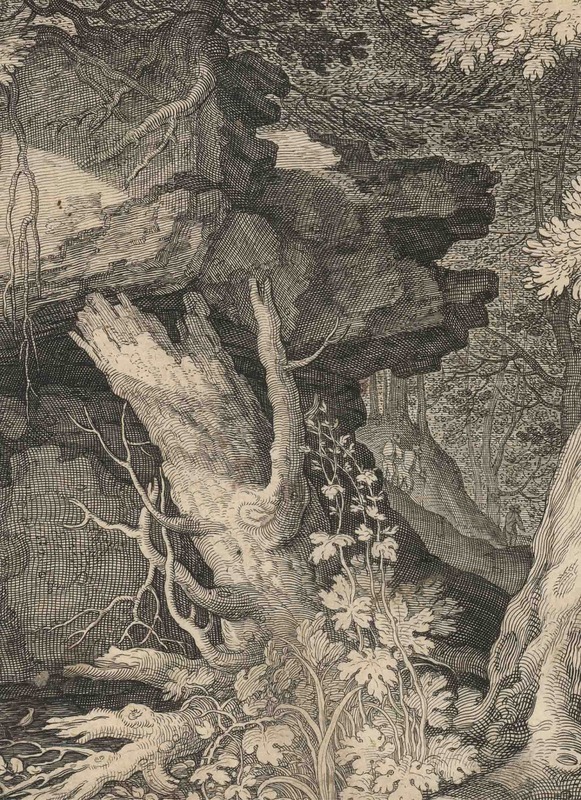 One of the most prevalent tree metaphors in art is the concept of regeneration wherein a cut or broken stump of a tree is juxtaposed with fresh growth. 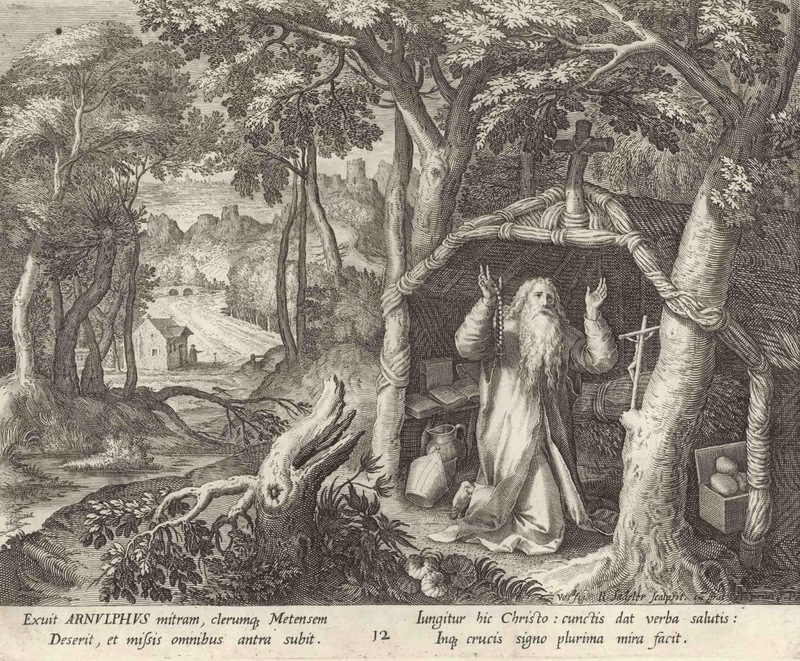 A typical example of this juxtaposition can be seen in Raphael Sadeler’s (1584–1627/32) Saint Arnulf (Arnoul) of Metz (shown below). Here, the broken stump of a regenerating tree featured in the foreground becomes a metaphor for sacrifice and redemption—a central tenet of the Christian faith—when viewed in context with the praying saint and the symbol of his devotion: the crucifix. From my reading of the image, the contextualisation of the stump as a metaphor is not accidental. There is a clear triangle formed between the direction that the stump is angled and the two crucifixes portrayed—one on the roof of the saint’s dwelling and the other on a tree supporting his dwelling. 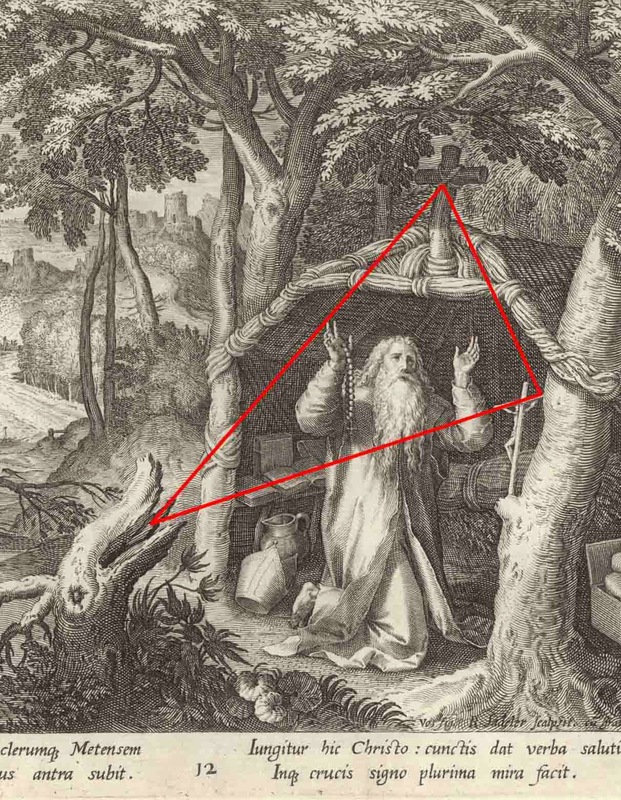 This triangulation in the composition, along with the devotional pose of the saint at the centre of the triangle, creates visual dialogue between these portrayed elements to project meaning (see diagram further below). Condition: Superb and rare first state impression (before the “12” is erased for the second state). There is an ink stamp of a previous collector verso, a light pencil notation “53” and “4” in ink recto, and a stain rising from the lower middle and ending 1 cm before the plate mark; otherwise in very good condition (for its age). I am selling this print for a total cost (including shipping to anywhere in the world) of $130 AUD. Please contact me using the email link at the top of the page if you have any questions or click the “Buy Now” button below. 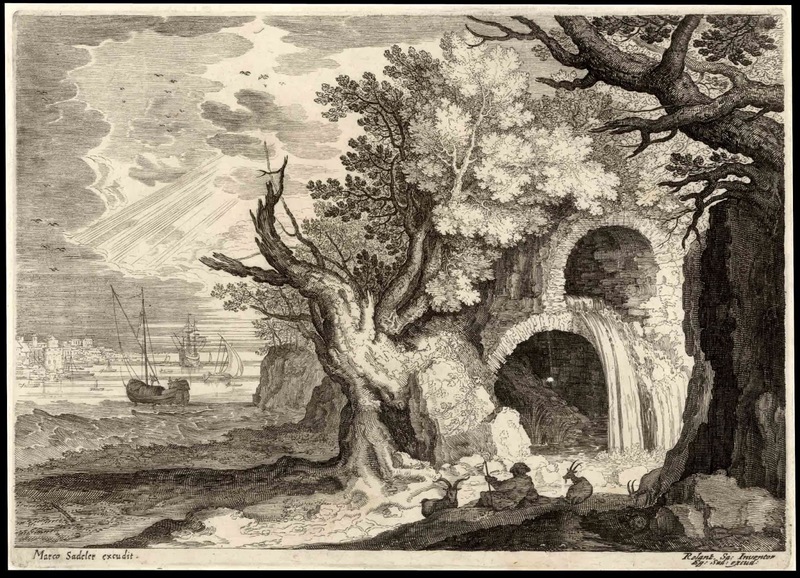 Another fine example of the regenerating tree metaphor can be seen in Aegidius Sadeler’s (c.1570–1629), Aqueduct, Waterfalls, and Grotto (shown below). 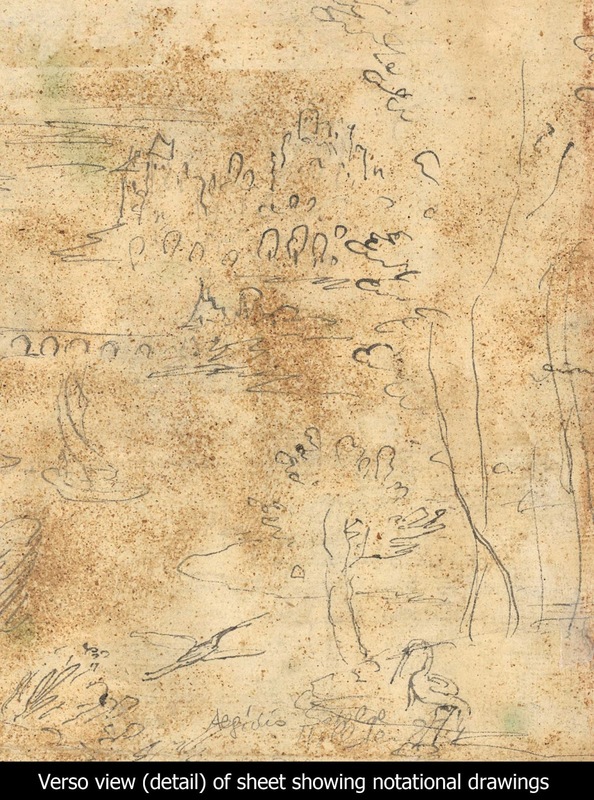 Here the regenerating tree is depicted in the middle-distance of a landscape. 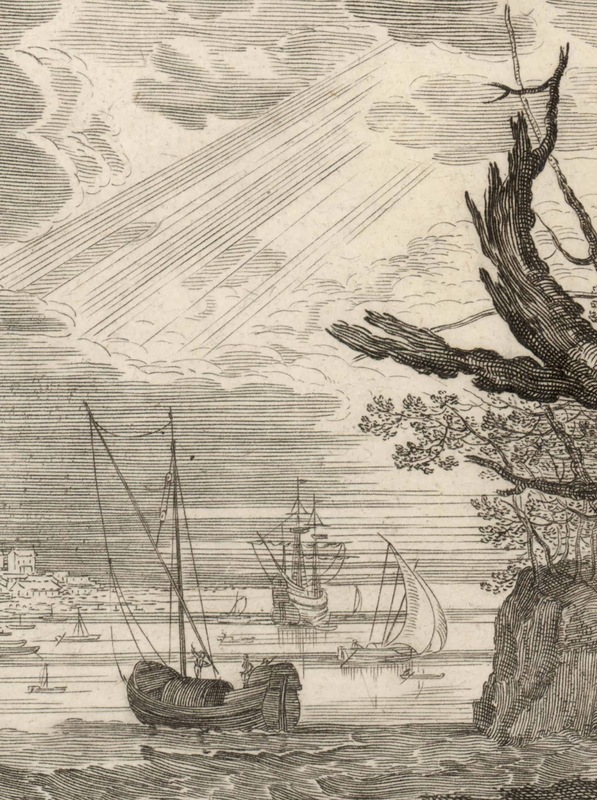 In this position the tree serves the critical role of visually “explaining” the connection between a recumbent shepherd portrayed in the foreground and a far distant burst of sunlight in sky that he appears to be contemplating. My interpretation of the regenerating tree’s role in this context may, of course, be incorrect, but I see it as projecting two meanings. The first is that it illustrates the concept of the cycle of life and death. 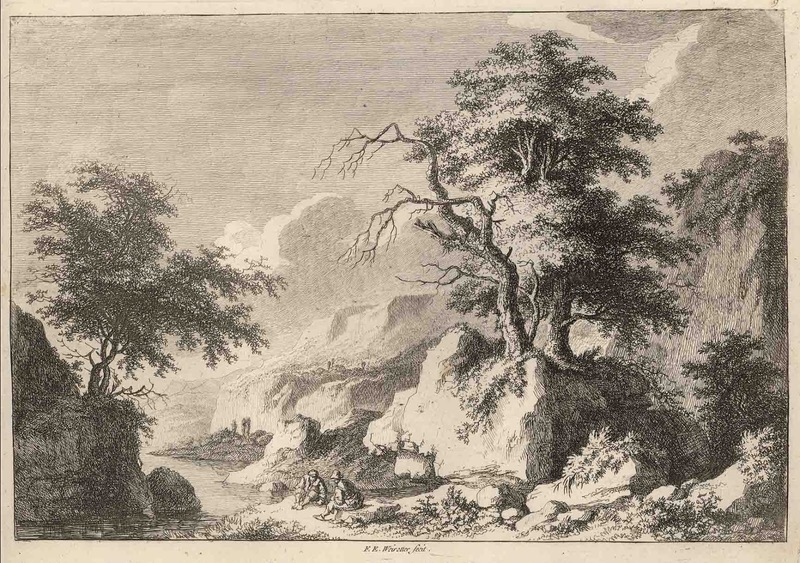 The second, and more interesting for me, concerns the position of the tree in the composition, in that it lies midway in the shepherd’s line of sight to the burst of sunlight. 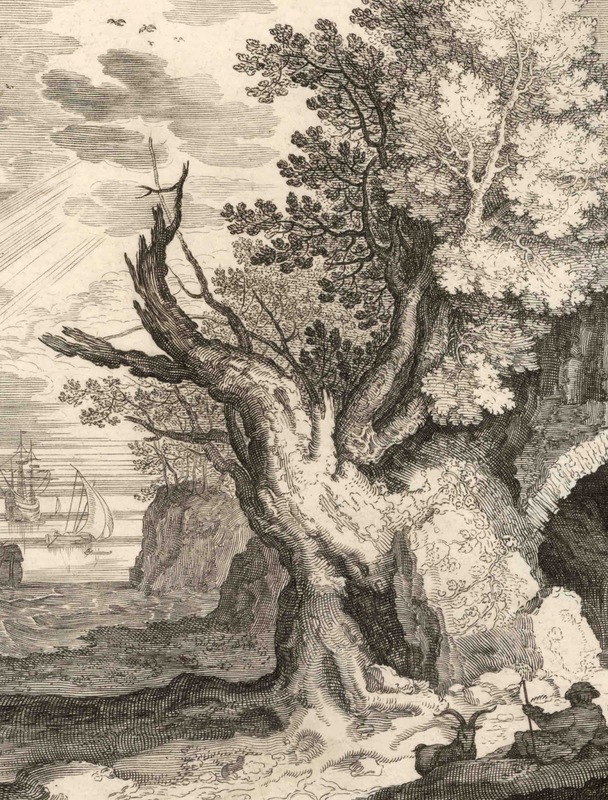 This position suggests that the tree is a point of departure, or trigger, lifting the shepherd’s thoughts from everyday temporal concerns to thoughts of spiritual transcendence in a heavenly abode. Condition: Superb, crisp, well-inked impression with no stains or foxing. 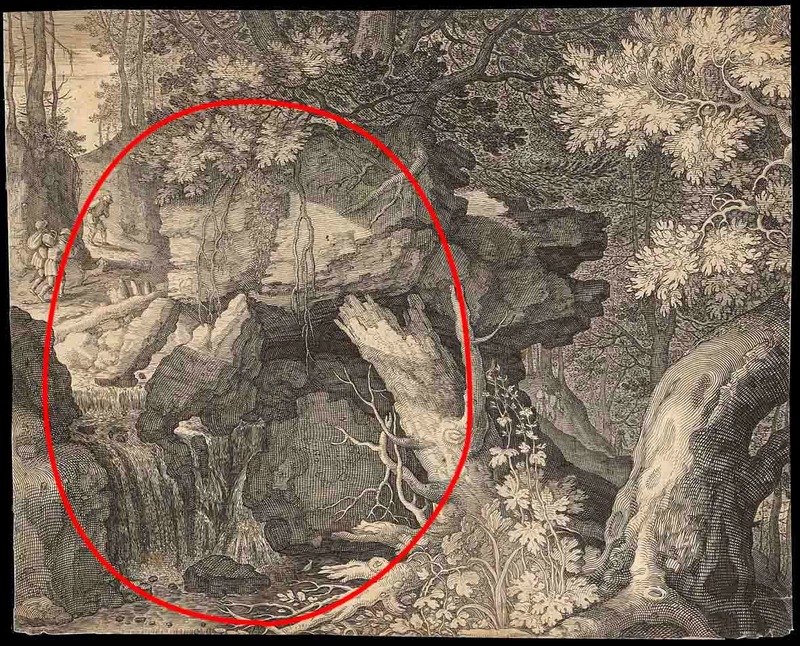 There is a fold mark passing through the centre of the lower grotto and a tiny dot (loss) along this fold mark that can be seen at the centre of this grotto. I am selling this print for a total cost (including shipping to anywhere in the world) of $175 AUD. Please contact me using the email link at the top of the page if you have any questions or click the “Buy Now” button below. 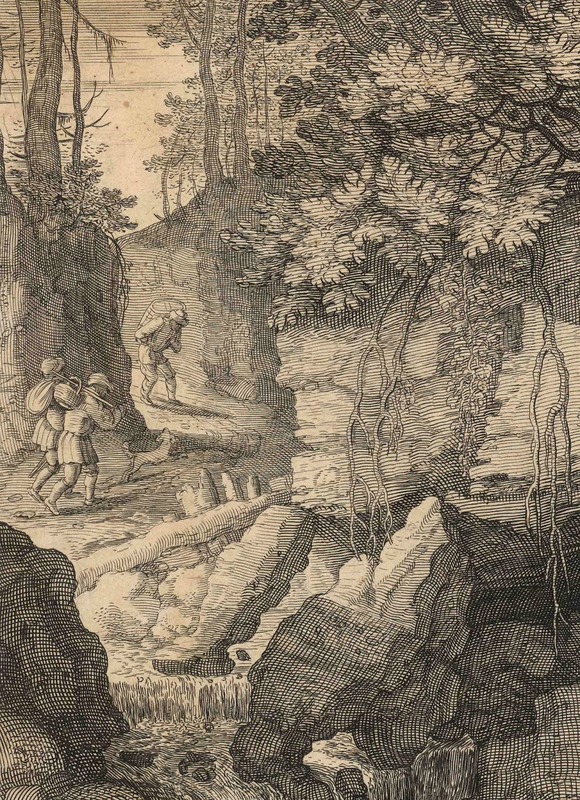 As a final example of the regenerating tree metaphor (before shifting the discussion to other forms of tree metaphors in the next post, Trees as Metaphors [Part 2]), I wish to focus on another landscape by Aegidius Sadeler: The Miners on the Mountain (Wood Landscape with a Waterfall) (shown below). Here, a regenerating tree, depicted in the middle foreground, exemplifies the cyclical nature of life surrounding it. For example, a stream to the left of the tree changes into a waterfall as it is broken into a cascade of rivulets by its rocky plunge only to re-emerge once again into a stream below. 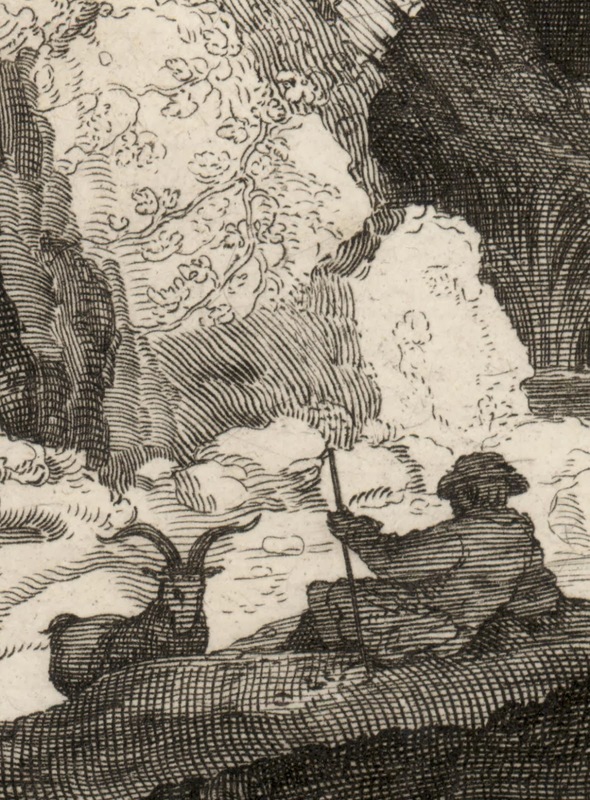 A similar cycle may be conceived involving a pair of figures—miners—featured in the top-left of the composition. These figures are shown walking along a curve in a road with another figure returning in the opposite direction; in short, a never-ending cycle of going somewhere and then coming back only to head out again. Without too much of an imaginative stretch, the notion of a cycle is also suggested by the circular rhythm in the composition involving the broken stump, lush growth on top of a cliff that the stump is angled towards, the downward flow of the stream and upward course of the stump’s roots that completes the circular rhythm (see diagram below). My interpretation of this circular arrangement is that nature—synthesised down to tree, water and rock—is an ongoing process involving all the elements in creation and destruction. 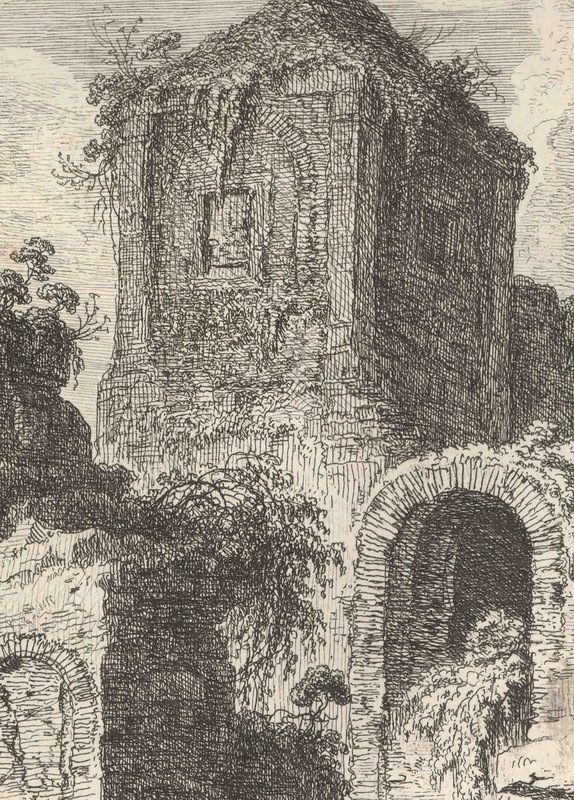 Condition: Marvellous and strong impression of this extremely rare print. 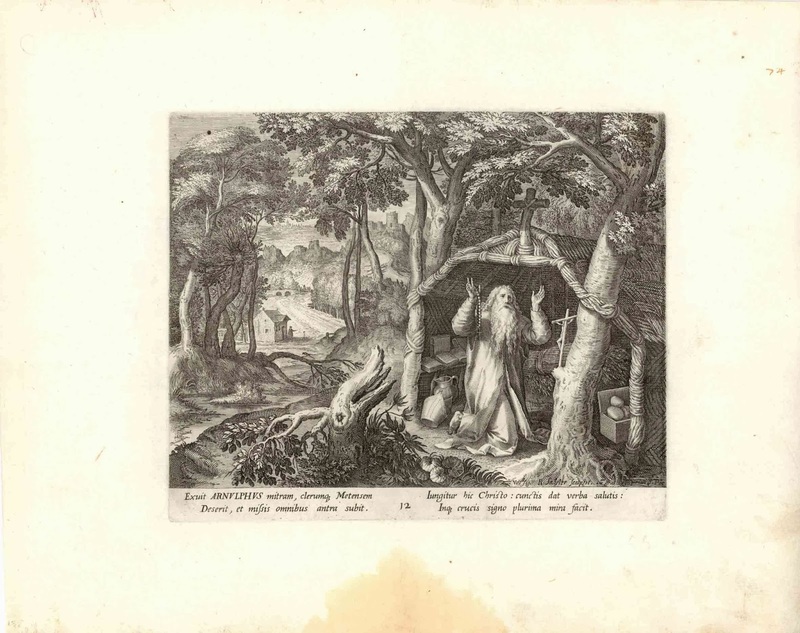 (Note that this print has been described as being "of utmost rarity" as there as been "no auction results for twenty years.") 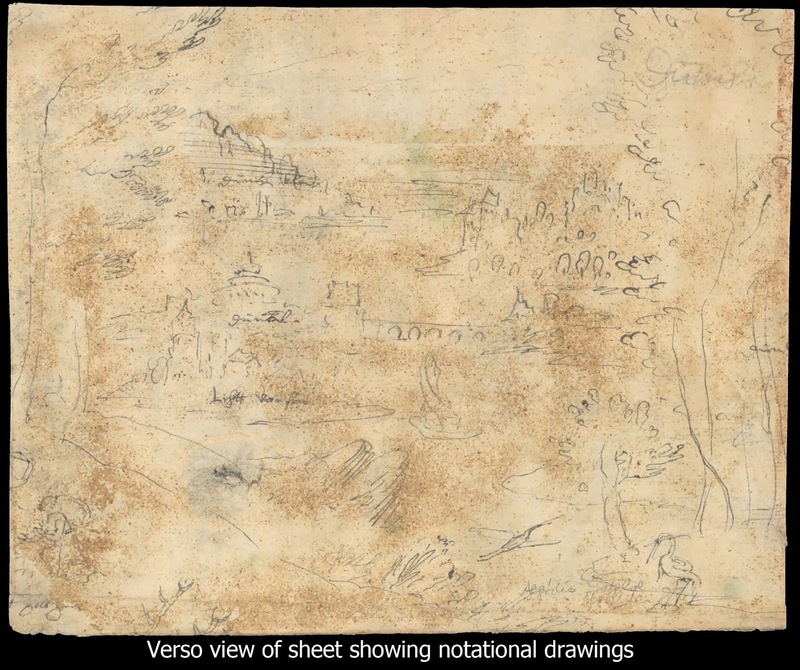 On the back are notational ink drawings that appear to be by an old hand. 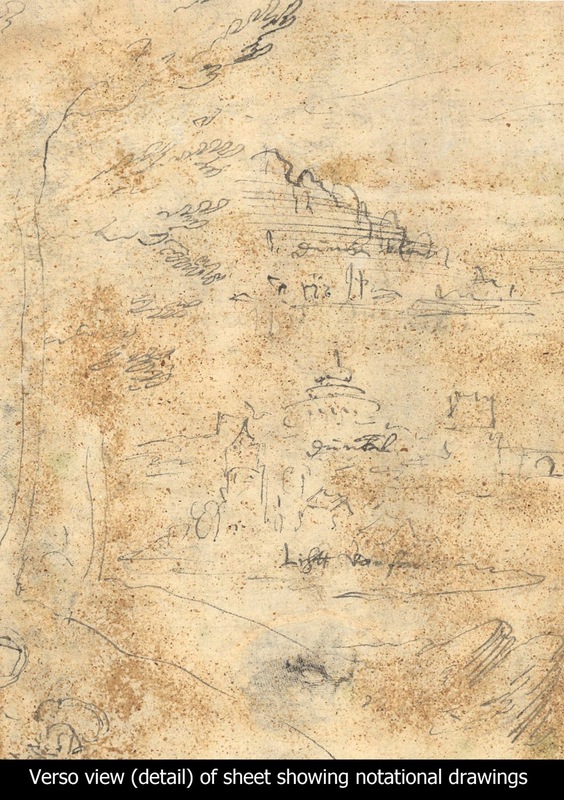 There is a 1.2 cm tear at the bottom-left and a patina of age (as may be seen in the verso view below). I am selling this print for a total cost (including shipping to anywhere in the world) of $525 AUD. Please contact me using the email link at the top of the page if you have any questions or click the “Buy Now” button below. Use of the regenerating tree motif is not, of course limited to metaphors. Some artists simply portray a scene that is in front of them without the need to make their artworks pregnant with meaning. Consequently, a broken tree with regenerating grown that is in front of them is simply that: an observed tree. Nevertheless, the extensive use of this motif in compositions, especially during the sixteenth and seventeenth centuries, provides strong evidence that many artists were consciously choosing and crafting their portrayed imagery to project meanings unambiguously. 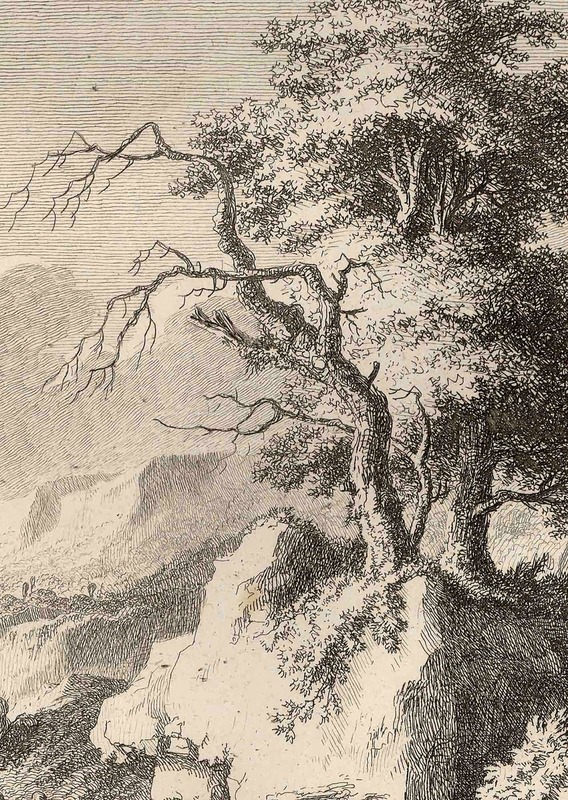 In Part 2 (the next post) I will again address how artists have used trees as metaphors, but this time the focus will be on artists’ use of trees to express mood. Thanks for your generous comment. A few positive words like yours makes a big difference. An impressive share, I just given this onto a colleague who was doing a little analysis on this. And he in fact bought me breakfast because I found it for him..